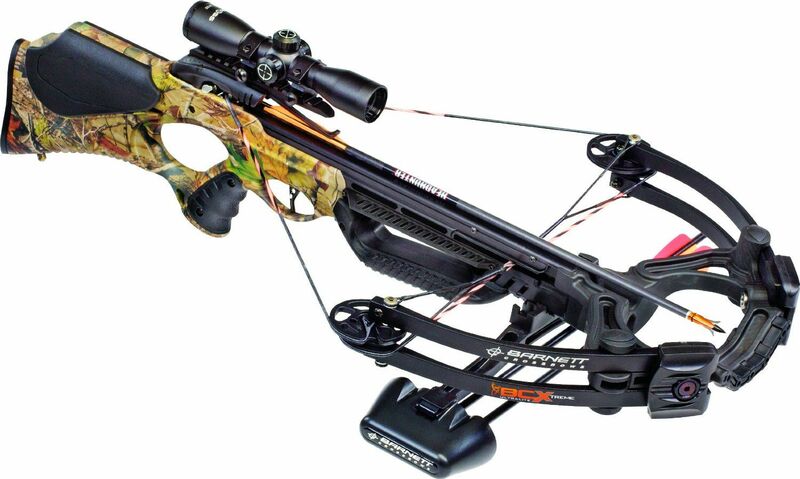 For more than 50 years Barnett has been manufacturing high performance crossbows for its customers. Dedicated to designing a crossbow that is efficient, fast, powerful, and easy to use, the company may have accomplished this with its Buck Commander Extreme. It comes with the sturdy, well balanced build you would expect from a top rated company, with a sleek design that is fun and easy to use. If you are looking for an affordable, durable and fully functional crossbow, this model might be exactly what you are looking for. In this Barnett BCX Buck Commander Extreme Crossbow review, we’ll put a light on different aspects of this model to help you make a better choice. One of the first aspects to consider on any crossbow is its build. Not only do you want it to be durable and well balanced, but it should also come with a lightweight construction that won’t cause arm fatigue. This not only makes the crossbow more comfortable to handle, a lighter and stable build helps to ensure accurate shots without wobbling. The Buck Commander Extreme comes with a lightweight construction that is easy and comfortable to handle. To ensure stability and reduce weight the riser is 43 percent lighter than other models. Since the weight is redistributed onto the shoulder of the crossbow it has the stability shooters need to make accurate shots, while still being extremely comfortable to handle. The aluminum flight track ensures a smooth and fast release, without adding any unnecessary weight to the bow’s build. Exceptional durability is the right word here. The Buck Commander can survive the drop eve from 10 feet without a scratch. Even the string will be safely latched in position. Barnett has used Barnsdale laminated-limbs, which include AVI technology – Anti Vibration Isolation, designed to reduce the noise-level by 20-30%. The design of a crossbow will affect its performance and appearance, which is not a concern with the Barnett Buck Commander Extreme. The sleek black limbs give it a stylish appearance, while the high definition “Real Tree” design on the stock makes it easy to blend in with your surroundings outdoors. The realistic paint is also designed to last for years, and is resistant to cracking and flaking. Barnett’s skilled engineers are committed to safety, and this is reflected in the crossbow’s design. This is also what makes this bow an excellent choice for beginners and more experienced hunters. The safety switch will prevent accidental misfires, and you also have the benefit of the anti dry firing device. This not only prevents bolts from accidentally firing before you are ready, it will also stop the dry misfires that can ruin the overall performance of the bow. You will also appreciate the smooth trigger that is easy to pull, while still providing you with a “crisp” feel. Even though Barnett crossbow lies in the category of mid-price range crossbows, the Buck Commander is far too powerful for home-made targets. You can easily forget about the target practice from the distance of less than 20 yards, as the force is more likely to splinter or shatter your arrows. It is a powerful crossbar and many people will simply love the performance they will be able to deliver with it. How a bow performs will determine how successful your hunting trip will be, and you have the advantage with the Buck Commander Extreme. It is capable of speeds up to 365 feet per second, and each shot is backed by up to 118 FP of kinetic energy. This gives you the speed and power you need to effectively penetrate through most targets. Adding to the bow’s strong performance abilities is the 185 pound draw weight. While this provides plenty of power behind each shot, it can also be difficult for some younger archers to pull. To ensure everyone can enjoy the same results from the crossbow, Barnett has added a rope cocking device that will smoothly draw the string back. This also makes it easier to hold a draw until your shot has lined up, and for an extra fee you can switch to a hand crank device. Whether you are a beginner just starting out or an experienced archer, this package includes everything you need to start aiming and firing at targets. Along with the included instructions that will walk you through the simple set up steps, all of the necessary tools are also provided. It should be mentioned that there have been an occasional problem with the design of the crossbow, which can cause issues with its assembly. Since this is a well known manufacturing problem, Barnett will replace the part free of charge. The crossbow also comes with a lighted 3 x 32 mm scope that is easy to adjust for accurate shots. The convenient quiver keeps your arrows close at hand, and the crossbow also comes with three bolts so you can start immediately start practicing. With everything you need included in this affordable package, it is easy to see why Barnett has remained a top manufacturer of crossbows. The crossbow includes everything you need to start practicing your shots, along with a convenient cocking mechanism to help ensure a smooth and tight draw. With 118 pounds of kinetic energy behind each shot, you can humanely take down small and large game. Priced to fit most budgets and designed for almost any type of bow hunter, it is easy to see why this model remains a consumer favorite. It comes with a sturdy, lightweight, and balanced build that is easy for almost anyone to handle. You will appreciate the safe and comfortable design of the crossbow, especially if you are a beginner. Capable of producing speeds up to 365 feet per second so you can easily keep up with your target. It should be noted that this crossbow does not include a dampener, and its slightly loud design might not be ideal for all hunting scenarios. All in all, the Barnett Buck Commander is a good deal for anyone looking for a simple, but effective hunting crossbow. It offers plenty of value behind it. Even though it is a compound crossbow, you will find it very quiet and low-maintenance.